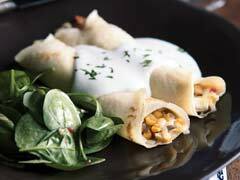 These Uruguayan style corn crepes are topped with a white sauce and often made with ham or porcini mushrooms. This is a simplified version of that classic dish! Combine shredded cheese, mushrooms, hard-cooked eggs, corn and peppers in medium bowl; cover and refrigerate until ready to use. Preheat oven to 350ºF. Place 1 cup of the milk, flour, sour cream, eggs and salt in blender; cover. Blend until smooth. Let stand 10 min. Spray 8-inch nonstick crepe pan or saute pan with cooking spray. Heat on medium-high heat. Add 3 Tbsp. batter; tilt pan to evenly cover bottom with batter. Cook crepe 30 sec. on each side or until lightly browned in both sides. Stack cooked crepes with parchment paper in between each one. Continue with remaining batter to make a total of 12 crepes. Fill each crepe with 1/3 cup shredded cheese mixture; roll tightly. Place filled crepes in 13x9-inch baking dish; cover with foil. Bake 25 min. Meanwhile, bring remaining 1 cup milk to boil in medium saucepan; reduce heat to simmer. Stir in cream cheese; beat with wire whisk until well blended. Remove from heat. Pour hot cream cheese sauce over baked crepes. Crepes are the perfect dish to serve for a special occasion. Prepare crepes as directed; wrap tightly. Store in refrigerator up to 1 week or frozen for up to 1 month. Blend your favorite spice or herb into the cream cheese sauce for an extra boost!